Recently I decided to try HF packing. Having located and securing an ALICE pack, planning how to equip it became the next priority. Over the years I had owned several different HF transceivers capable of man portable operation. After reading posts and reviews made by others pursuing this segment of our hobby, I chose the Alinco DX-70 for the task. It is a proven reliable rig and eHam reviews were encouraging. Also the used selling prices are reasonable. I found a nice one on QTH.com for $400 shipped. I purchased my DX-70TH back on '97 and it is still in use today. The only failure was when EMP from a lightning strike to my QTH took out one of the dual diodes on one of the filter boards. The thing that I like about this radio is that there are very few bells and whistles that get in the way for mobile use. 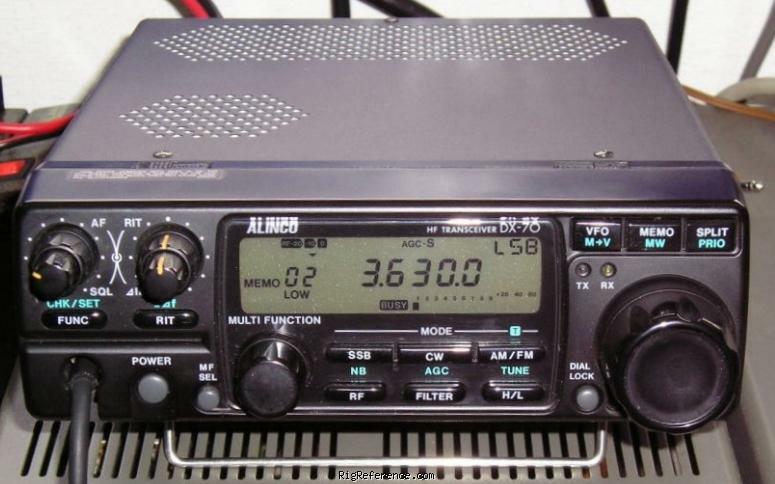 There are only two things that really wasn't thought out by Alinco which got it a 4 on ergonomics which was the PL tone frequency dip switched on the bottom of the radio which is just plain goofy. Also, the separate RF connector for meters is awkward depending on your configuration. Again, there are no menus to get lost in and it is straight forward and easy to use. Just wonder why the DX-SR8T/E, the DX-70's replacement, doesn't support 6 meters. I've owned the DX-70 since they came out in the late 90's. It's been exclusively a mobile rig although I have used in in the shack. As a mobile rig it is a pileup buster! Many DX stations worked through pileups. I teamed it with a Clear Speech DSP amplifier. Many hams complain about the noise blanker however simply reducing the RF gain (att) makes it shine! It will reduce noise 20-40 db. Rig is 17 years old and I'm looking to putting the new Alinco in the mobile. Estimating the value of a rig can be challenging. We collect prices paid by real hams over the years to help you estimate the current value of the Alinco DX-70TH. Just bought or sold this model? Let us know what you traded it for and help other ham operators!